When looking at becoming a millionaire, the age of 65 is where all the attention is focused. Why? Because generally speaking, that is (or is near) the age of retirement. Given that the average life expectancy is increasing it’s seen as important to have enough money to fund all the expenses that come in one’s later stages of life. A $1,000,000 net worth seems like a staggering number. It seems so high that many would dismiss it as even being possible. But when faced with a lofty goal, sometimes the best thing to do is break it down into smaller pieces. As you can see from this chart that recently appeared in the money section of Business Insider, when we focus on the trees instead of the forest we get a different perspective. The numbers in the chart above are based on a person starting with no money. The numbers don’t account for taxes and assume your investments pull in an annual return of 12% (which is doable but a bit high). So obviously the greater the return on your money the greater chance you have of becoming a millionaire. However, what the charts should also demonstrate is that anyone could become a millionaire based on a combination of any two of these three variables: time, income and choices. 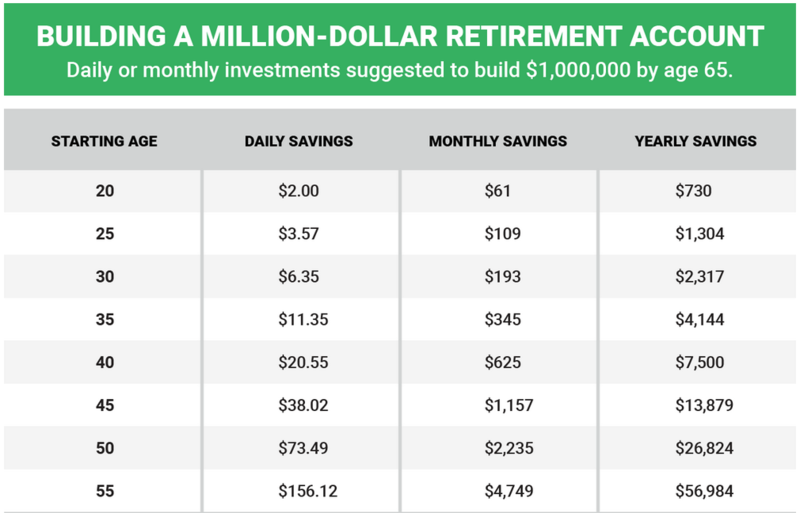 Of course the easiest path to becoming a millionaire by 65 is to have enough time, have enough income and have the sense to make the right financial choices. Put all three of those variables together and the path to a million dollars could practically be assured (barring any catastrophic life calamity). But what if one of those variables is missing? What if you make some poor choices along the way? Or what if your income is below average? What if you start the process too late in life? Could you still reach millionaire status with only two variables? I’d say, “Yes, you still can.” Let’s look at three possible scenarios on how this could happen. If you have enough time and if you have sufficient income, millionaire status is well within reach by age 65. A 22-year-old single, college graduate with no debt should be able to make it. So should the dual-income family in their mid-30s who make $80k a year. So could the late-blooming entrepreneur who started a business at age 50 and saw it explode to a $100,000/yr. net profit. The variable missing in this scenario – choices – is an important one. What a person chooses to spend money on and what they choose to use it for will go a long way in determining how wealthy they could become. However, I’d argue that a sufficient amount of time and income would be able to overcome some poor choices along the way. The key word there was “some.” Someone with a continual pattern of poor choices will be less likely to make it. But enough money and enough time would certainly be able to cover up a few financial sins. Time is such a crucial variable in the financial equation. Have it and the prospects look promising. Don’t have it and the goals get more and more daunting. Removing it makes your prospects of reaching a million dollar net worth by 65 a lot more difficult. As the charts show, a 20-year-old has significantly less to invest per month at all percentage return levels than someone who is older. The older you get, the more you have to invest on a yearly basis in order to reach the goal by age 65. A 50-year-old making $50k who decides to start investing isn’t going to make it given that current income level. There simply isn’t enough time no matter if he or she makes all the right financial choices from then on. What would be needed to make up the difference is an increase in income. If income can be increased and more money invested, then the time factor can be minimized. But, depending on your age an income increase can be hard to come by. It’s certainly doable but the challenges associated with a significant income bump remain great. It may mean a career change. It may mean working more hours or finding a second job that takes you away from family. Or it may mean cutting your lifestyle to the bare bones. For those reasons, I place it below Time Plus Income on level of difficulty. Let’s get the obvious out of the way first – if you have no income you have no money to invest and no chance at becoming a self-made millionaire by 65. However, if you were making the right choices about life and career you’d have chosen to secure a job. So for this scenario I’m assuming the income is insufficient. When I say, “Income is insufficient” I’m saying the person is just scraping by. There is only enough to cover the necessities of life. Therefore, without additional income to pour into investments a million dollar net worth will be out of reach no matter the time left or the choices made. But let’s hold on for just a second. When I think about people in tough financial situations, like the 30-year-old single mom with three kids, could she still make it? Is a million dollar net worth by age 65 within her reach? Could she save $2,500 per year and depending on the rate of return potentially hit her goal? Mathematically the answer is yes. That’s the good news that comes out of even the most difficult scenario. What it would boil down to is the mental, emotional and physical make-up of that person – which is why this is the toughest one-variable-missing scenario in my mind. Could she or someone like her in a tough financial situation maintain the discipline and stamina for 35 or more years to meet the needs of her family while still trying to improve her financial future? Is it possible for even her? I believe there are really strong-willed people out there who could balance this kind of life make the difficult choices and eventually become a millionaire. I also have to think that in the end – of all the scenarios I’ve covered – this group may experience the most satisfaction with reaching millionaire status. What a reward at age 65 that would be for them to look back and appreciate all they’d been through. Wherever you find yourself there is a scenario where you could become a millionaire by age 65. Some paths may be easier than others but it’s definitely doable based on time, income and choices. 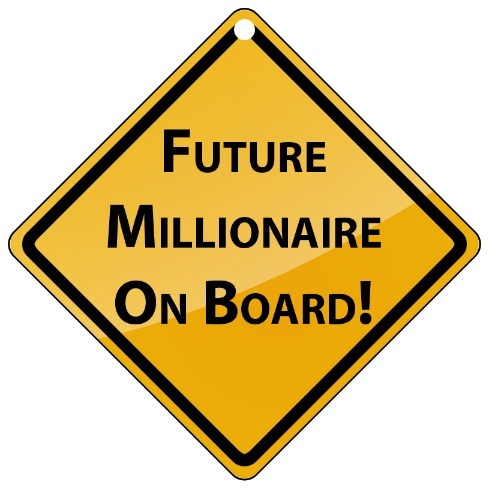 Questions: What do you think about the different scenarios to becoming a millionaire? Would you put these scenarios in a different order? If so, why? Do you think having a million dollar net worth by age 65 is even important? What choices/sacrifices are you making now to insure your financial future is a bright one? It’s very challenging to become a millionaire by the age of 65 years. Now, I have a list of strategies in how I can be someday. I am glad that there are ways that guarantee results but it still varies depending on situation of each person. So, I think they have to discover it themselves and find their own way to become a millionaire. Jamie recently posted…Do You Know How Other People Perceive You? The chart is really helpful, Brian, which made me realize that smaller amount of money is really helpful and a big factor in achieving our goals and in becoming a millionaire someday. Jayson recently posted…Testing the world of online freelancing – Is it worth the effort? Great post about compounding, and even better because you broke down the factors that contribute to the end goal, and looked at the possible scenarios. Compounding definitely seems to be a concept that only a minority of people can grasp. 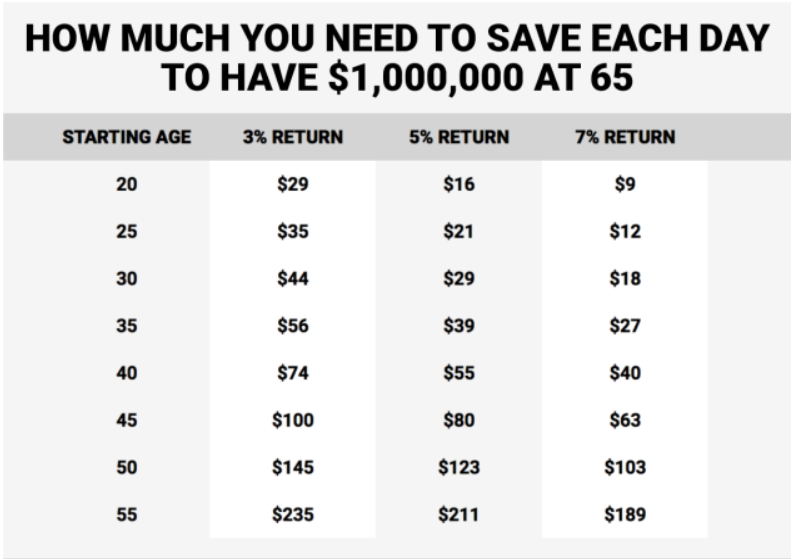 And even if you don’t become a millionaire, *ANY* savings is better than none! Good job presenting the scenarios. I recently read an article about saving a million dollars which said most people don’t understand the power of compound interest. In my opinion it’s more like most people ignore the power of compound interest. They think savings can wait, and before they know it, a decade or two has passed, and it’s difficult to make up for lost time. Love this! I’m glad you broke it down and talked about other variables that can affect these charts. It is interesting that the only thing equal to all people is time. We all have the same time. We may not have the same income but we’ll all have 24 hours a day and it will likely take time to be rich. It’s amazing how powerful early investing is even with nominal amounts. I just try to tell folks to not complicate the process. Save early, keep saving and investing and watch it grow! The satisfaction of watching your money grow is greater than any purchase you can make. Lance recently posted…How Much Does a House Cost? “…the only thing equal to all people is time.” Great insight Lance! It’s just how we take advantage of the time we are given that matters. Good information. Thanks for sharing that it’s not always easy. I think many often paint a rosy picture or try to put a cookie-cutter approach in place, when in fact everybody’s circumstances will vary. Money Beagle recently posted…Is Our Mortgage Payoff Too Aggressive? “…everybody’s circumstances will vary.” That’s a good point. Some people will definitely have it easier/harder than others based on their life situation. It is important to build wealth. You need to be prepared for whatever you want to do in your future, when you not longer want to work or are unable too. Saving money early, consistently and being actively involved are the best things you can do. Consistency really is a big issue Brian. I think many people are challenged with that. They get fired up about it, go for a time, but then get disrupted for some reason. Got to fight against getting distracted and thrown off course.